I had a choice of three movies; well four if you count Beauty and the Beast but, hmm, I don’t think so. So what was it to be: Elle, Logan or Get Out? I’d heard Elle has a lot of sexual violence and, see, that’s not entertainment for me – once maybe to establish a plot and motive etc but after that I think it gratuitous, or rather, why aren’t I at home painting the saucepans? And while I enjoyed, in an ‘I really shouldn’t enjoy this’ sort of way the early X-men franchise I had to wonder if Logan was stretcher things a mite far. So I plumped for a horror comedy. I’m sceptical about horror and, frankly, the best horror comedy has to be Shaun of the Dead – not, I won’t accept other opinions on this (Scream and Scary Movie are okay, and all); to deny this truism is to deny your species. So I took a chance with my £8. The premise is simple, trite even. White girl takes black boyfriend home not telling them he’s black. He expresses reservations; she’s cool but they are awkward trying to say the right thing and failing. Maybe this was the comedy but Sidney Poitier did it better in Look Who’s Coming To Dinner. Try this and see. So, okay a few rather simplistic laughs at the faux pas as the parents try and say the right things and the couple cringe. But appearances are deceptive as the staff, black of course, appear to be simple minded and, necessarily rqther creepy. PLOT SPOILER: of course this is the horror; they are enslaved, trapped by the hypnotherapist mother and neurosurgeon father in their own bodies but with other (white folks) personalities. It gets bloody, it gets ridiculous and it doesn’t, at least not to this Brit, get funny. I don’t really like gore so looked away at the brain surgery but that was as bad as that got and it didn’t last. Maybe this is really aimed at the US market and didn’t travel that well. Some of the reviews, calling this a modern satire had to have missed the US election for what real satire looks like. It was light, it was fluffy, it had a few smiley bits and a little cringe but frankly it had the substance and taste of a Tesco’s fish pie. The audience seemed split: some cheered on the hero when he battered the surgeon; others seemed indifferent to the whole things as I could see the telltale glow of right-swiping being undertaken from 20 minutes in. Even Scary Movie 57 had more gags than this and, as for horror, try Hitchcock. On the ice cream front, the good news was a new brand – Judes – appeared in the freezer cabinet. As I was alone I tried both the salted caramel and the Madagascan vanilla. The vanilla won hands down. I wonder if I should give it a star rating? Maybe devise my own ice cream tubs; if so this was definitely a two tub movie – sugar boost needed. PS if you’ve seen Logan and Elle what would you recommend? 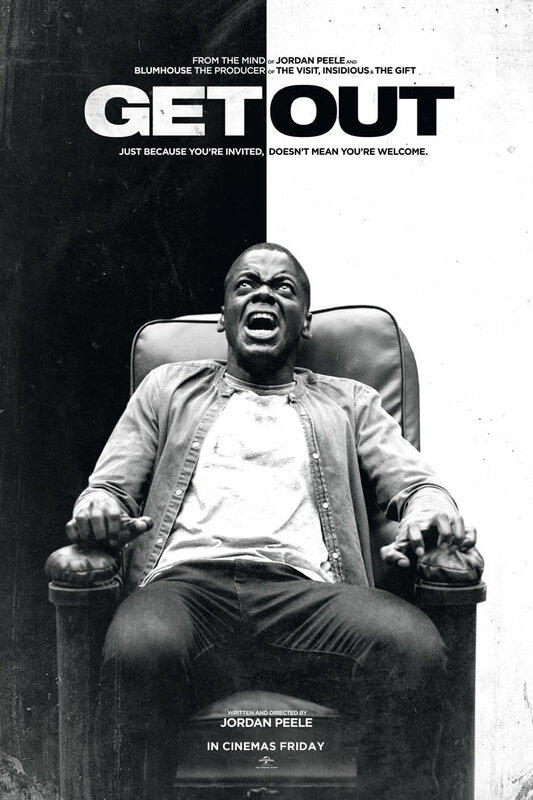 This entry was posted in Film, miscellany, review and tagged film review, Get Out. Bookmark the permalink. I’d stick with Sidney Poitier, frankly. You would probably have been better off going to Beauty & the Beast. Dare I say you’re right. Poitier did it better, and without gore !! He was sure a beautiful actor. I’m goign to see I, Daniel Blake tonight so expect there will be much gnashing of teeth, raised blood pressure and deep depression by the end of the evening so to cheer myself up a bit I’m seeing The Eagle Huntress tomorrow night. Now I’d love to hear what you think. I usually enjoy Loach films for all the simplistic polemics of their messages. I, Daniel Blake was really good. I’d read a lot about it when it was being made including about the woman in a job centre who blew the whistle about what was going on with sanctions, etc so I knew what to expect, including the simplistic polemic of its message. It is still a powerful film which, several times, caused the audience to become utterly silent. The man next to me said at the end, ‘And the moral of this is, this could happen to any one of us.’ Should be compulsory viewing for every politician and job centre staff. I’m so glad I went back the next night to see The Eagle Huntress – a wonderful, life- affirming, feel-good documentary/film. It was shown before and I missed so I’m really pleased I managed to get to it this time. Do see it if you get the chance. I’d like to help you out on the theory it’s targeted to US market, but I really don’t want to see it! Come on, you missed Beauty and the Beast? Lol! Maybe I should allow my inner fairy out and go see B&B. I like to think of her as a fairy not a beast!! Ha, ha! I like better, too! Well yes sweet treats make up for a lot. Yes the corruption of solo entertaining, that duo Ice cream. Heartily to be recommended. Not seen any of the films (though my other half will make me sit through Beauty and the Beast at some point and I’ll probably try and catch Logan – I’ve heard it’s one of the better ‘X-Men’ films). Judes Ice-cream I know well though – bravo on the two tubs – I’m going to cite your example when I’m next dragged to something I don’t really want to see (the aforementioned Disney film being a likely candidate…). Ugh. I loathe horror films, so I’d never see this one, and your review confirmed it! I think I’d see Logan, but then I’m entranced with the character (and the actor)! I’ve seen Logan and came away from it feeling a little conflicted. As an X-Men movie, it did something completely different which was clever and made the film more interesting. The violence, on the other hand, felt extremely gratuitous (and I say that as someone who likes gratuitous violence). Nevertheless, I’m glad I watched it. Best horror comedy, by the way, is American Werewolf in London. No question.